Does anyone know any books that compare Roman Catholic doctrine and Lutheran doctrine? I’m a Missouri Synod Lutheran engaged to a Roman Catholic. We have a very healthy relationship and often discuss our beliefs with each other. We are both very interested in learning more about how Lutherans and Roman Catholics relate to each other, and differ from each other. It would be great to find books that provide a good neutral standpoint. Or perhaps a book that has a dialogue between Roman Catholics and Lutherans. (I should not I am not interested at all in ELCA Lutheran theology. ELCA is completely different than Missouri Synod). I aim to present Luther as he was: no more, no less: as fairly as I can, but ?warts and all,? too. 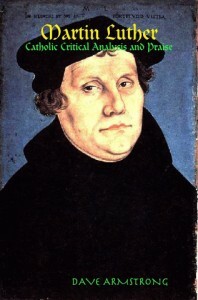 I do not regard Luther (like many Catholic biographers and critics throughout history) as an essentially ?evil? or ?bad? man. I don?t deny his good intentions and sincerity at all. Part Two: the ?praise? section of this book, runs 83 pages, or about 34% of all the material from Chapter One to the Bibliography. I shall be citing the portions of Luther’s writings that Catholics would agree with. The ecumenical endeavor is devoted to finding things that Christians have in common. This book will do exactly that. If I can persuade a few people that Catholics and Lutherans have more in common than either side (for the most part) imagined, I’ll be more than happy and fulfilled, having accomplished my goal. I still have to read these three articles. If anyone has any Lutheran-Catholic books, please let me know in the comments. And if you know anything about Dave Armstrong, I’d like to hear about him as well. Thank you. Thanks for this mention of my Luther books. My most vocal Lutheran opponent is Pastor Paul McCain. He has written a number of ridiculous things about me that are demonstrably untrue. 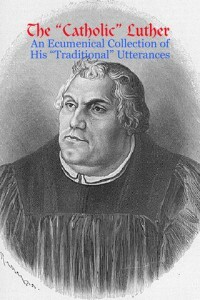 I also get accused by “traditionalist” Catholics of being too kind to Luther. It’s like anything else: a lot of people take it personally when you disagree with their theology or their “heroes of the faith,” as it were. Consider reading “There We Stood, Here We Stand” by Timothy Drake. It recounts the stories of eleven former Lutherans who rediscovered their Catholic roots. I’m a former LCMS member who joined the Catholic Church in 2000–I’ve written a monograph on the relevant issues, especially justification by faith alone: http://www.robkoons.net/1773.html “A Case for Catholicism”.